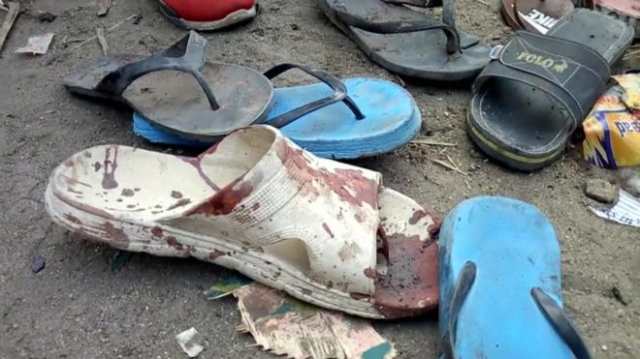 MAIDUGURI, Nigeria (AP) — A trio of suicide bombers detonated at a crowded fish market in northern Nigeria, killing at least 20 people, police said Saturday. Borno state police spokesman Joseph Kwaji confirmed the Friday night attack to The Associated Press. Hospital officials said two patients later died from their injuries. The bombers, all believed to be female, left dozens wounded at the fish market in Konduga, just outside the state capital, Maiduguri. The city is the birthplace of the Boko Haram extremist insurgency and has been a frequent target. "I came to the night market to buy fish for dinner when I heard a loud bang some meters (yards) behind me and I saw myself on the ground, and before I could pick up myself another one went off then, the third one again," he recalled. "I couldn't stand any longer and just laid down but everywhere was in total confusion." He added: "From the wailings, one can tell that there are many casualties."